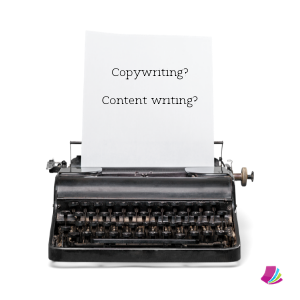 Content Writing vs. Copywriting: What is the difference? Unknowingly, bloggers tend to identify themselves as content writers, or even copywriters, without an inkling of what they are saying. A blogger may be a writer who crafts a 200-word post because they are inspired to do so, or because they are skilled at creating a quick message. There isn’t a solid connection between writing when you feel inspired to do so vs. writing compelling content that keeps the reader reading or copy that compels the reader to plop down something personal (i.e. money or an email address). So, is there a connection between content and copywriting? Yes! Purpose is the defining line between content writing and copywriting. Think of a copywriter as an immensely talented salesman who persuades people to take action through text (written or printed work). A copywriter’s precise purpose is to promote, advertise, and directly market through written copy materials. The purpose of a content writer is to capture the reader’s interest, to inform, and to build trust. The two roles intertwine, so buckle your seatbelt for the twisty ride as I sort it out. Content helps to market brands. Through well-structured blogs and website articles, content educates readers and markets brands as the experts. You may have heard the advice, “Keep the blog post short. In today’s society, people are no longer readers.” Content writers do not follow this “rule.” They spend a sizable chunk of their time completing research and fleshing out content to create comprehensive and evergreen articles that captivate the reader—basically keeping them on the page (reading…and reading…and reading). Why does content writing not follow the “keep it short” rule? Content is a tool that establishes brands as authoritative and knowledgeable leaders in their industry. I recently read an article where it was obvious that the writer knew nothing about the topic. The post was short and sweet, granted, but I didn’t want to linger long. I learned zilch! I wondered, “Why even bother reading this filler material?” It was a waste of my time, and I vowed to never visit the website again. Tip: Think of content as web real estate that never goes away. Real estate that search engines index. The more acreage your content claims, the more success in search results. Written copy is geared towards pitching either a product or a brand. Unlike content, the focus of copy is to influence the reader with a short-term goal—to sign up for the newsletter, or to leave an email address, or better yet, to buy a product! Remember, the purpose of content is to educate the reader, and even though this is important for the trust of a brand or product, it does not compel the reader (emotionally) to subscribe or to buy—as does copy. Copy is found in a host of places, anywhere there is an audience for advertising. So, the next time you hear someone say, “I am a copy (or content) writer,” you’ll know EXACTLY what they do. We can only hope…and perhaps you can help (us/other) writers educate the world (remove some of the mystery), so potential clients, and want-to-be writers understand the foundations of copy vs. content. Credit: Does Anybody Really Know What Time It Is?